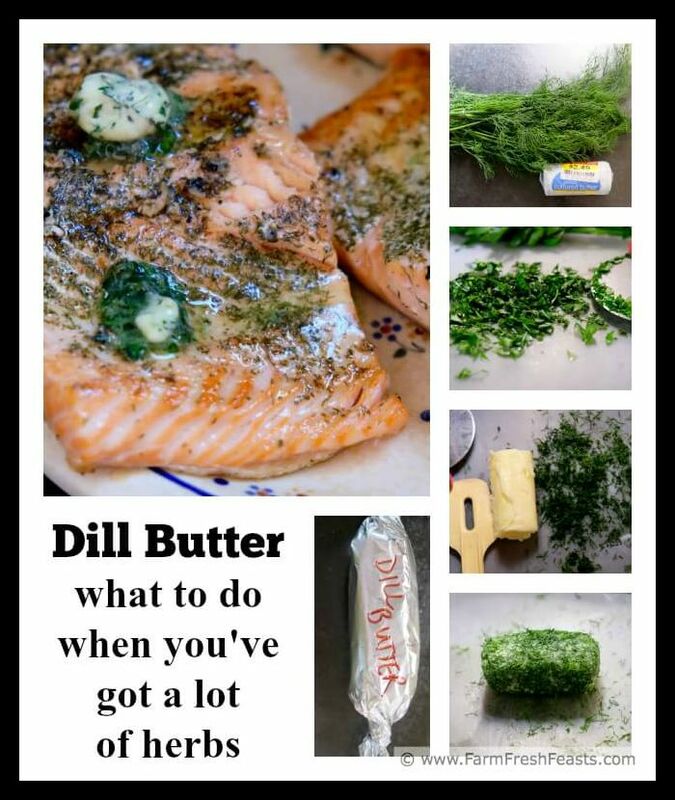 Got a lot of dill? Quickly turn it into an herbed butter. Use this butter on potatoes, fish, or bread. It's a fast way to add a little something local & homemade to your holiday table. Time for another Practical Support for Local Eating lesson. This one is about herbs. When we get herbs in our Community Supported Agriculture (CSA) farm share it's not usually a sprig here and there. Instead it is a significant amount. Sometimes I view the abundance of herbs as an opportunity to use them all in Pot Luck Tabbouleh. Sometimes this will coincide with another vegetable and create an opportunity to put something up [a bunch of cucumbers and dill means I'll throw a few jars of quick refrigerator kosher dills into the back of the fridge to cure]. Sometimes a large quantity of basil from the farm share coupled with my own large quantity from the garden means I can Process a Pile of Pesto. Most of the time, however, the herbs are on their own. Making herb butter when you've got a lot of fresh herbs is one way to make the most of the farm share. This freezes nicely and makes a special addition to a holiday meal. Too early for Thanksgiving talk? Canadian Thanksgiving is only a few weeks away and I've got a beautiful bunch of dill from my farm share so I think it's quite timely. Before I get to the recipe, though, I asked a few food bloggers for additional ideas on how they deal with a large amount of herbs. 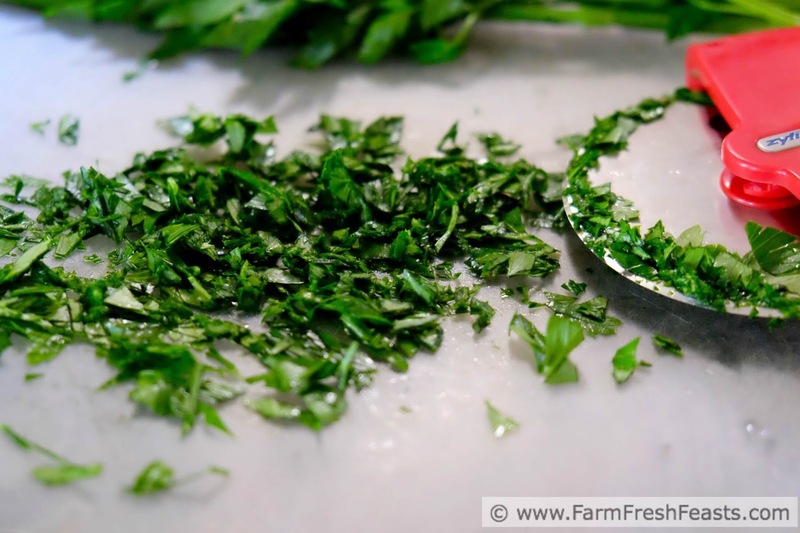 Brandy of Farmer's Wife Rambles shares how she dehydrates parsley. Tara of Noshing With The Nolands turns her basil abundance into Basil Ice Cubes. Sheri Silver freezes her herbs in oil--with a clever tip for telling them all apart in the tray. 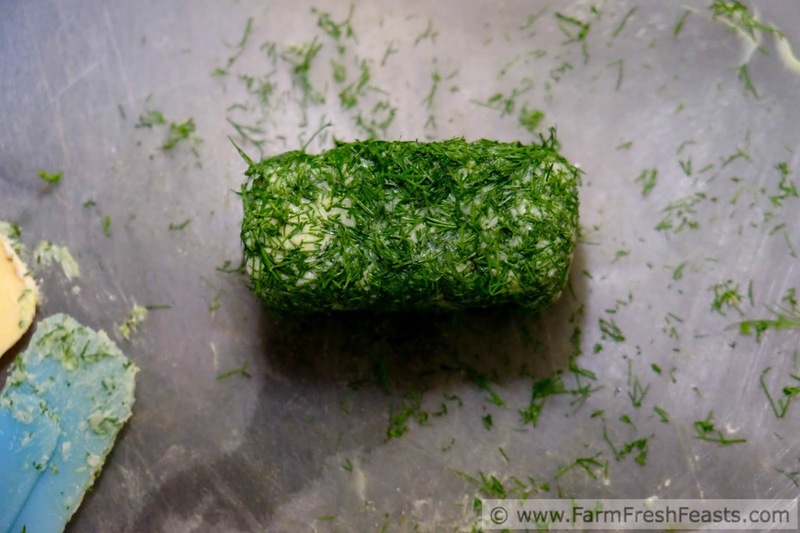 Meghan of Clean Eats Fast Feets shares how she deals with her chives (and shares a recipe for Blue Cheese & Chive Drop Biscuits). Janelle of Barn2Door dries thyme, oregano for cooking, mint & blackberry/raspberry leaves/fennel seed for tea, and freezes finely chopped chives. She even has a Pinterest board of herb-y ideas. Left to right photos from Brandy, Tara, Sheri and Meghan. Thanks! 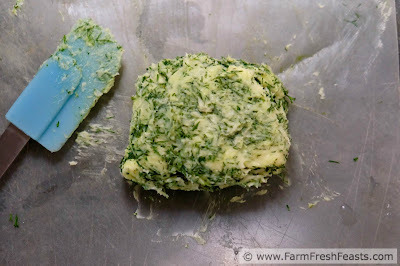 When I make herb butters I use something other than the plain unsalted that I usually buy for everyday baking. The fancier salted butter you start with, the better your end result will be. I'm showing both the olive oil & butter blend my son showed up with after I sent him to the grocery store to pick up butter for cookies as well as a magically marked down stick of sea salt butter. 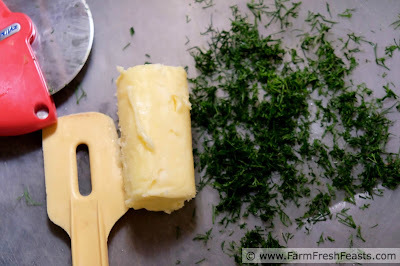 I have personal experience making single flavor dill, parsley, and rosemary butters, as well as my Cranberry Honey Butter, and I bet that an herb blend would be wonderful as well. Karly shares how to make both Sweet and Savory Compound Butters here. If you went through a bento phase and have rice molds in your seldom-used kitchen equipment box in the basement like I do, you stuff the softened herb butter into the rice molds. Chill them overnight in the fridge before popping the butter rolls out, wrapping, and freezing. 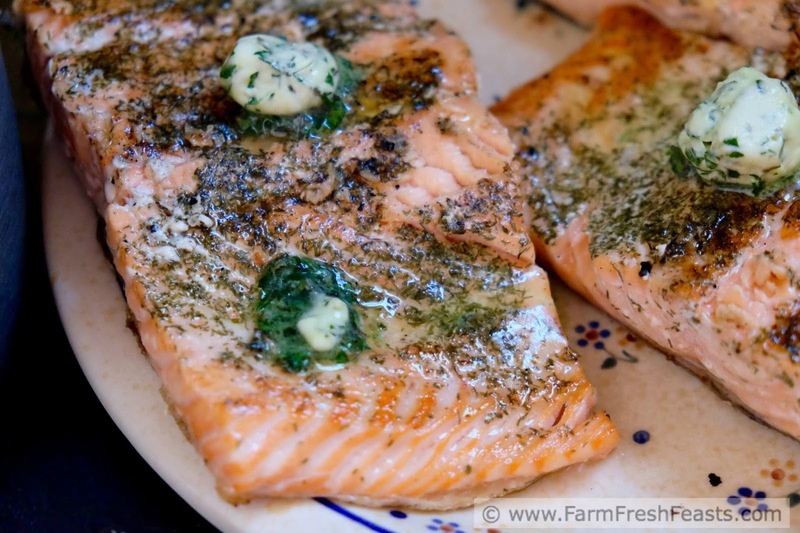 On a cutting board or other easily cleaned surface, smash butter and ½ cup chopped dill. 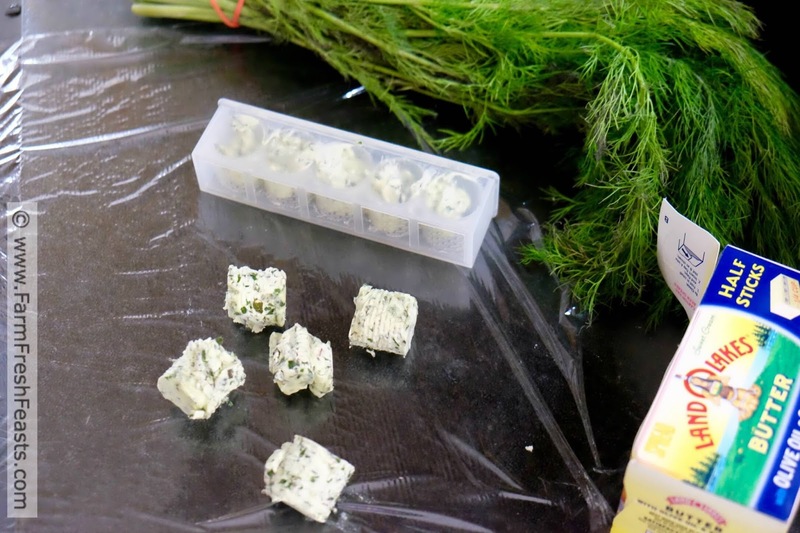 Form it into the shape that pleases you and roll in the remaining dill to coat the outside. 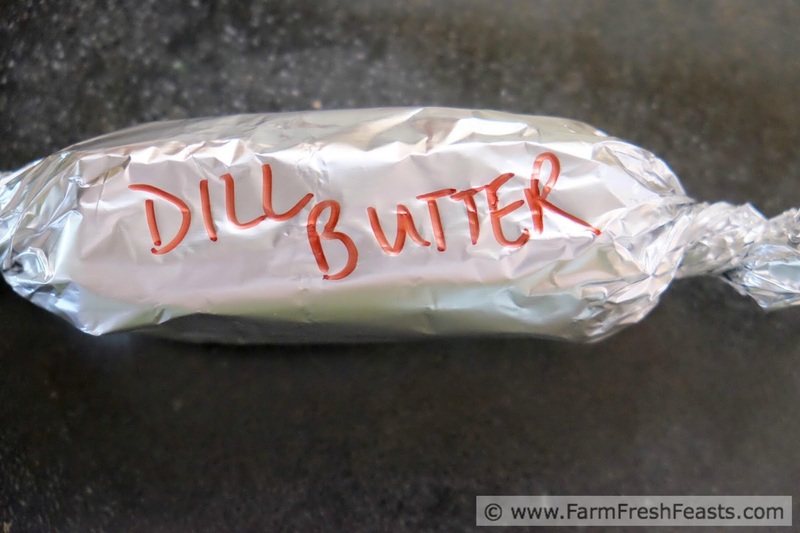 Wrap with parchment paper or plastic wrap, then foil, LABEL, and freeze until needed. 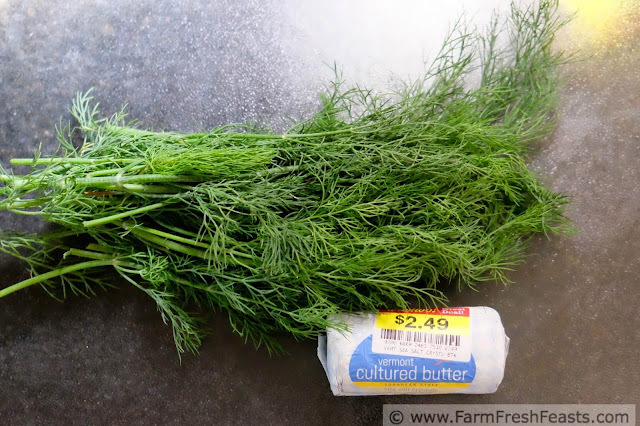 You can use this dill butter on boiled potatoes, baked or grilled salmon, noodles . . . endless possibilities other than tossing the slimy remainders into your compost bucket! I should probably not end a blog post with slimy remainders. For more recipes using Herbs, please see my Recipes Using Herbs Collection, part of the Visual Recipe Index by Ingredient, a resource for folks like me eating from the farm share, the farmer's market, or gardens gone wild. Want to know how to use this blog? Click here.